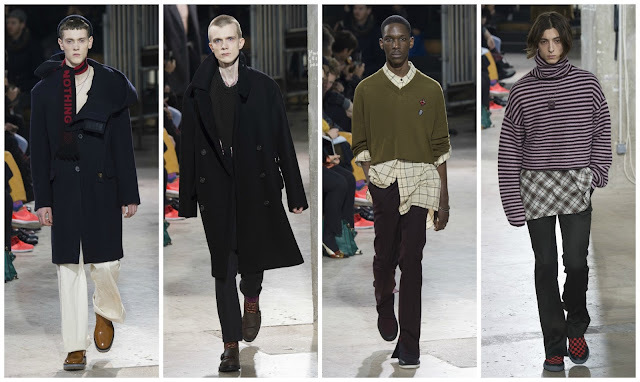 Lucas Ossendrijver’s Lanvin menswear collections were the perfect male counterpart to Alber Elbaz’s womenswear; his work is characterised by a similar romance, functionality and fey air with vagabond tendencies. With the arrival of Bouchra Jarrar at womenswear, replacing Elbaz, there is somewhat of a disconnect between the two divisions of the brand. Jarrar’s unique brand of boudoir dressing is innate to her and she adds a feminine sensuality to the brand. Ossendrijver opted for a commentary on fashion’s everlasting fascination with sloganeering. “Nothing” was written on the scarf with the opening look. This was a marked difference to the Louis Vuitton show which opened with a Supreme branded item. Although Ossendrijver played into the logo-frenzied fashion moment—and the accessory is likely to sell to hotcakes—it was humorous, tongue-in-cheek finger pointed at the other fashion corporations—however, Ossendrijver insists he wasn’t criticising the other brands. “There is nothing in the desert and no man needs nothing” was written on a bomber jacket. The Shakespearean theme of nothing pervading this collection was indicative also of the lack of new ideas in fashion, and also of consumerism. Ossendrijver, a skilled menswear designer, at Lanvin for 11 years, loves newness. The silhouette of a dark leather jacket was an uncharacteristic in a menswear collection: it was cinched at the waist and featured velcro fastening. It explored new territory for his menswear. Also decidedly feminine was the louche, flared trousers. Many looks in the collection considered ideas of gender ambiguity, the models’ gender indistinguishable, their clothes (defining them in outdated societal terms) were too. It was the feminine brushstrokes, however, where Ossendrijver succeeded. While there were feminine undertones, there were predominately boyish and youthful motifs. One model in a purple, striped turtle neck, asymmetric plaid shirt and black trousers reminded me of Jack Kilmer’s Teddy, an angst-riddled, sleepy skateboarder, in Gia Coppola’s LA-set drama Palo Alto. 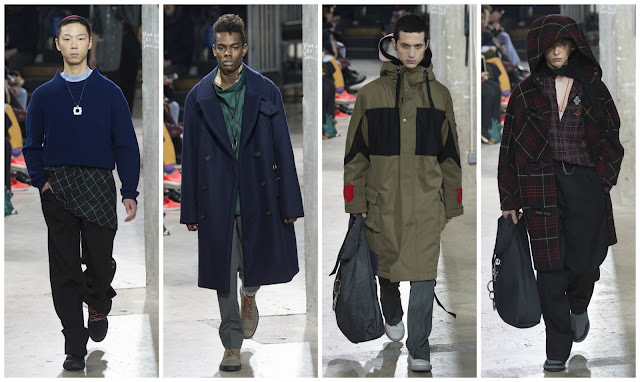 I often associated Lanvin’s menswear—and womenswear—with an older, more refined customer but here the message was loud and clear, even if the word “nothing” was scribed on many looks: Lanvin will be a brand that wants to be something to everyone in this age. In the fickle fashion industry with changes afoot, designers are adapting at different paces. What is becoming clear in these uncertain times is that the so-called old guard designers (i.e. the ones who were once satisfied with catering a mature client and not interacting with social media) are having to rethink strategies. They have to seamlessly blend the items they target the older clientele with and the items and ideas they target the younger customer with… As you’d imagine it’s not always to aplomb. Here, Lucas Ossendrijver created a poetic response to the times, skewering the relevant reference points necessary for Lanvin to be well and truly in the game.